I started Deer Island thinking I’d just read for thirty minutes before bed. I put it down in the early hours, when it was nearly finished and all hopes of a full night’s sleep were gone, and I’m still trying to define its appeal. The quality of the writing certainly has something to do with it; the prose is clean and bare, yet wonderfully descriptive, but there is something more than style. I’m also trying to define the book. It doesn’t fit easily with convenient labels. ‘Memoir’ is probably the closest fit, since it structured as personal recollections. 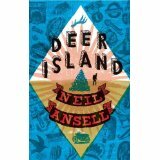 Ansell has lived and worked with the destitute, has himself been a squatter, and has wandered the wild places of the earth. This slim book could also be seen as a series of vignettes; of poverty, of lifestyles, of places, all of which are articulated with sharp clarity. I think I was hooked by the way he writes with such respect, even love, for the kind of people most of us hurry past in the street; the alcoholics and homeless beggars, Ansell’s friends and companions during his years serving with the Simon Community. There are also descriptive passages of intense beauty; it’s worth buying the book just for the paragraphs where he emerges from a freezing rainstorm in the Kalahari desert to see a scimitar-horned gemsbok standing under an extraordinary, purple sunset. His descriptions of Jura, the ‘Deer Island’ of the title, could inspire me to shoulder a backpack and start walking North. I’m left with the impression of a man whose life is richer for carrying so little with him, ‘Memories,’ he says, ‘are the only things we truly own, and even they slip from our grasp if we don’t handle them with care’. Previous Previous post: Author copies!